What is the agenda behind this, of Obama blaming the Russians for the Election fraud when Obama knows the truth? [and from another] https://www.yahoo.com/gma/video/implications-us-sanctions-russia-084547760.html [and from another] http://www.rollingstone.com/politics/features/something-about-this-russia-story-stinks-w458439 Nearly a decade and a half after the Iraq-WMD faceplant, the American press is again asked to co-sign a dubious intelligence assessment. Absent independent verification, reporters will have to rely upon the secret assessments of intelligence agencies to cover the story at all. Many reporters I know are quietly freaking out about having to go through that again. We all remember the WMD fiasco. This report is long on jargon but short on specifics. More than half of it is just a list of suggestions for preventive measures. If the American security agencies had smoking-gun evidence that the Russians had an organized campaign to derail the U.S. presidential election and deliver the White House to Trump, then expelling a few dozen diplomats after the election seems like an oddly weak and ill-timed response. Voices in both parties are saying this now. [and from another] https://www.rt.com/op-edge/372280-obama-sanctions-hacking-election-russia/ The Democrats fully intended to blame the Russians if the election went Donald Trump’s way — and as expected, since November 9, they have been gung ho about Putin stealing the election from Hillary Clinton. Clinton voters, many of them, fully believe groups of hooded Kremlin-backed hackers in Vladivostok stole their election. They believe this with such ferocity because it is what they were told to believe by their party, by their country’s intelligence agencies, and by the media. The hurt feelings after losing the election could only be alleviated by directing the blame toward outside forces that had nothing to do with their candidate or their campaign. 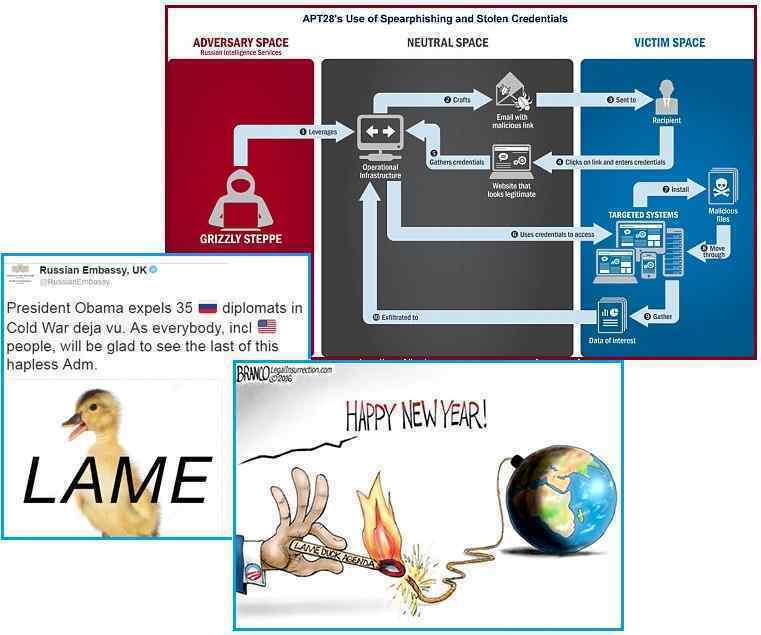 Obama has just a few more weeks to force Trump to “admit” that Russia interfered with the election, thus forcing him to begin his term on a more sour note with Russia. It surely can’t be a coincidence that these sanctions were communicated on the day a new ceasefire was announced in Syria; a ceasefire organized by Russia, Iran and Turkey, with the US playing no part. [and from another] http://www.dailymail.co.uk/news/article-4076968/Trump-allies-accuse-Obama-trying-box-president-elect-Russian-sanctions-anti-Israel-vote-string-minute-executive-orders.html Obama has engaged an eleventh-hour torrent of regulation, executive orders and diplomatic snubs, throwing tacks in the road ahead of Donald Trump. [and from another] http://www.infowars.com/washington-post-stirs-fear-after-false-report-of-power-grid-hack-by-russia/ The Washington Post reported Friday that the U.S. power grid had been hacked by the same Russian actors accused of breaching the DNC – the only problem, the grid wasn’t hacked. Why is the USA parking all of its aircraft carriers at the same time? Isn't that a very risky move or is there a hidden agenda? [and from another] http://www.zerohedge.com/news/2017-01-01/first-time-world-war-ii-no-us-carriers-are-deployed-anywhere-world For The First Time Since World War II, No US Carriers Are Deployed Anywhere In The World. A quick look at the latest positioning of US aircraft carriers, amphibious ready groups, and other navies around the globe shows a gaping hole in the region of the East or South China Sea, and even in proximity to Japan, a place where the US navy traditionally has maintained at least one carrier group. In fact, the only active carrier group is USS Dwight D. Eisenhower CSG, conducting naval operations in the U.S. 6th Fleet area of operations in support of U.S. national security interests in Europe." As it turned out, the Eisenhower carrier group was on its way back to dock in Norfolk, VA, which means that for the next several weeks, not only will there be no U.S. Navy aircraft carrier in the Middle East or the South China Sea. [and from another] http://www.foxnews.com/us/2016/12/30/no-us-carrier-at-sea-leaves-gap-in-middle-east.html For the next week, not only will there be no U.S. Navy aircraft carrier in the Middle East, but there will be no American aircraft carriers deployed at sea anywhere else in the world, despite a host of worldwide threats facing the United States. While there is no U.S. aircraft carrier in the Middle East right now, there is a large deck U.S. Navy amphibious assault ship with thousands of Marines on board as well as helicopters and some jets to respond to a crisis. It is believed to be the first time since World War II that at least one U.S. aircraft carrier has not been deployed. [and from another] http://www.infowars.com/dems-want-war-with-russia-to-stop-trump/ January 2, 2017. John McCain calls for war with Russia. [and from another] http://www.infowars.com/sitting-ducks-every-single-active-u-s-navy-aircraft-carrier-currently-sitting-in-port-against-protocol/ January 2, 2017. The entire U.S. Navy aircraft carrier group, 10 active carriers, have returned to port and are now all sitting ducks. According to information displayed on GoNavy.jp, which tracks the current locations of all active aircraft carriers, the Obama Administration has ordered every single active U.S. aircraft carrier home. Why would Dunford call back all US aircraft carriers, en mass, into port? One does this to remove them from being used as tools by the dying group trying to trigger a war with Russia. We are speaking here of the Bush/Clinton criminal family, which includes the agendas of the European royalty, Israel’s Netanyahu, and those in charge of George Soros billions. The group pushing Hillary has clawed their way through the election recount, pushed to intimidate the electors into voting her in over Trump, and still hopes to trigger World War III before Trump is inaugurated on January 20. From the assassination of Ambassador Karlov in Turkey to the utterly false accusation that the Russians were responsible for the DNC and Podesta email hacks, they are kicking at Putin with everything they have. Setting off dirty nukes in US cities or using US nukes on submarines has not worked, as Dunford sent out C-130 planes to sniff out and block this cabal from creating a false flag scenario. Any sleeper cells within the US military will find they are trying to issue orders that are on their face in direct contradiction with official orders from Dunford, making it harder to deploy a false flag scuffle around the globe. Meanwhile, serious cleanup of the group trying to trigger war with Russia proceeds apace. There is a flood of articles on the Internet now claiming Nibiru will destroy our world on October 2017. Why did the establishment pick October out of all months?? Don't they know the Pole Shift is supposed to happen by the end of trimester? April, August, or December? What is this? [and from another] http://www.inquisitr.com/3850434/nibiru-doomsday-predictions-claim-the-world-will-end-in-october-2017/ January 3, 2017. Doomsday predictions about the world coming to an end in October of 2017 abound on the internet. Nibiru, or “Planet X” as it is sometimes called, is rumored to be on a collision course with Earth. David Meade, an author and researcher, is claiming Nibiru is an orbiting body of a “binary twin” of the sun — and its orbit placed the South Pole directly in its path. David Meade, who wrote Planet X – The 2017 Arrival, believes Nibiru is a large blue planet the Daily Mail reports. Meade has stated the sun’s twin will bring with it seven “orbiting bodies,” one of which being Nibiru. Planet X is a planet on the far edge of our solar system, some have hypothesized. Some conspiracy theorists believe the gravitational pull of Nibiru, which has been dubbed a “rogue planet,” caused disruptions of the orbits of other planets hundreds of years ago. The gravitational pull of the binary star Nibiru orbits is driving it towards the Earth, according to Meade. [and from another] http://www.dailystar.co.uk/news/weird-news/575148/nibiru-cataclysm-planet-x-destroy-earth-september-october-2017-exact-date-david-meade Conspiracy theorists have been warning a massive planet – called Planet X or Nibiru – will wipe out life on Earth for some time. Now a paranormal researcher claims to have combined astronomy, scientific research and the Bible to calculate the date of the apocalypse. In his book Planet X — The 2017 Arrival, author David Meade says the killer planet will first appear this September. And it will crash into Earth the following month. According to Meade, Planet X is actually a star with seven planets and moons – including Nibiru – orbiting it. The so-called “truther” explains we haven’t spotted Planet X or Nibiru yet as they are approaching from a different angle, above the South Pole. He said: “This makes observations difficult – unless you’re flying at a high altitude over South America with an excellent camera.” [and from another] http://www.itechpost.com/articles/70906/20170103/armageddon-october-2017-conspiracy-theorists-claim-mysterious-presence-planet-nibiru.htm January 3, 2017. Meade has highly emphasized that despite his urge to locate Planet X, the star is apparently difficult to spot due to the angle which seemingly looks like it is approaching Earth, from an oblique angle and toward our South Pole. Meade explains that there are 40 volcanoes erupting at the same time on Earth now. Earthquakes have dramatically increased both in number and intensity. Thus, the general public is being kept in the dark deliberately to avoid panic. As proposed by a number of astronomers in Caltech in January last year in Caltech in January last year, Nibiru is a different planet to the Planet Nine, which is also sometimes referred to as Planet X. Whenever the truth about Nibiru is anticipated, opportunists emerge. This occurred in 2003 with the Hazelwood flourish. Despite all the material available on the ZetaTalk website since 2003, internationally known, and despite Nancy even having produced a book for those who were web challenged, Hazelwood got on Coast to Coast ahead of Nancy to promote his book – Blindsided in 2003 – which was wholly plagiarized material from the ZetaTalk website. But where is Hazelwood now? Unable to predict or explain in the manner we, the Zetas do, he faded into the fog of history. More followed, with predictions on dates when Nibiru would arrive or create chaos on Earth, and these dates would come and go. The fame of these opportunists would be fleeting or certainly sullied by their failures. The more durable among these opportunists learned not to fix on dates, nor even to fix on a sequence of events as ZetaTalk has done – the 7 of 10 plate movements and the Last Weeks. But talking about the Hopi legends and selling books and dried food does not capture the imagination like solid dates, which almost always go viral on the Internet. That said, why is Meade’s book - Planet X — The 2017 Arrival – getting press coverage? It has been five days since the Zetas' stunning revelations about President Obama and his family. Given their past reluctance to divulge the President's thoughts and motivations, can the Zetas explain the reasoning behind outing Obama and his family now? How has this new information been received worldwide, and what are the implications for President Obama's legacy? One final question for the Zetas' consideration - I accept this may be flying too close to the Sun but I feel compelled to ask nevertheless. How has the publication of such personal information affected the President, his wife and children? [and from another] http://poleshift.ning.com/profiles/blogs/the-truth-about-obama The purpose of this blog is to counter the hatred, lies and disinformation being spread about Obama by those who don’t want the common man to be informed about Nibiru AKA Planet X in our inner solar system, and the Pole Shift that will result as it passes the Earth. Why has the crime cabal - composed, in part, of the Hillary crowd, Soros billions, the Jewish bankers, Netanyahu, and various remnants of the Bush cabal such as McCain - been so intent on starting war with Russia? There are several reasons, one of which is to weaken BRICS, the alternative banking consortium to the World Bank and the International Monetary Fund. The IMF created debt slaves out of Third World countries, where BRICS loans require barely any interest, setting them free. Russia is central to the BRICS consortium. Why did Michelle go on Oprah and state that hope was gone? Why the long faces on the Obama girls coming back from vacation in Hawaii? In blackmail situations, the power of the scandalous news is lost once the news is released, with proof. This is a powerful threat, but useless once used. Nevertheless, Michelle and Barack had to inform the girls, so they would be braced. The world of politicians is rift with such scandals, well kept secrets, and it is politically correct to pretend they do not exist. After these next few nervous weeks, the issue is likely to be forgotten. Life goes on. Any comments if needed. [and from another] http://www.vanguardngr.com/2017/01/earthquake-nigeria-measures-avert-devastating-impacts-experts/ January 4, 2017. Geologically, Nigeria is located in a so-called stable Pre-Cambrain–Paleozoic age Basement terrain believed to be seismically safe. 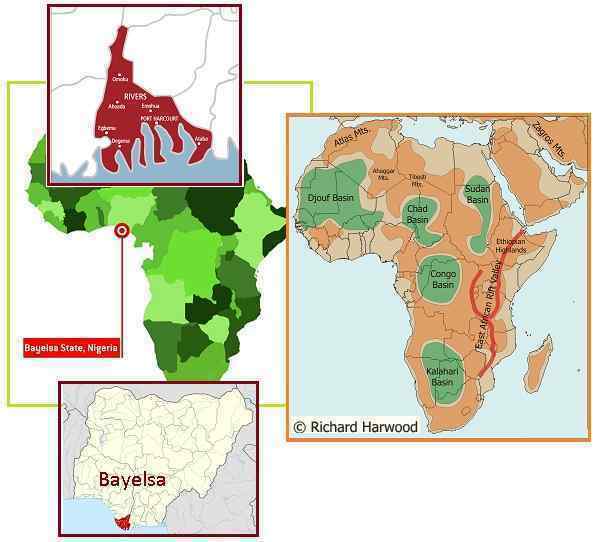 The tremors were widely felt within Bayelsa and Rivers states and this has changed the age-long belief that Nigeria is not active or free from earthquakes; and consequently, paving way for a new thinking and new focus on occurrence of earth tremors in the most populous Black nation. That Nigeria is having increased earthquakes should not be surprising. The African Plate is moving, rolling its top part to the East while it remains firmly footed at the tip at the Antarctica Plate. Residing on a jolting plate is not a quiet ride. While the top part of the plate crunches along through the Mediterranean, and the Red Sea pulls open, and the African rift valley droops, falling further toward the now unsupported side of the plate at the Indian Ocean, the western side of Africa also has issues. Africa is very old rock, and very stable. So stable, in fact, that any earthquakes come as a shock to those living on the continent. It is not that the rock strata under Nigeria is unstable, or that a new fault line might have been discovered. It is that Nigerian rock is being put under any kind of pressure at all. What would cause these quakes? When they learn that Africa is rolling, and why, they will understand. All of Africa will creak and shutter and jolt during this process. Nigeria has thin crust, where the rivers emerge to drain, so is just noticing this process earlier than most.